Home guitar How do you bend strings on guitar without wrapping your thumb around the neck? 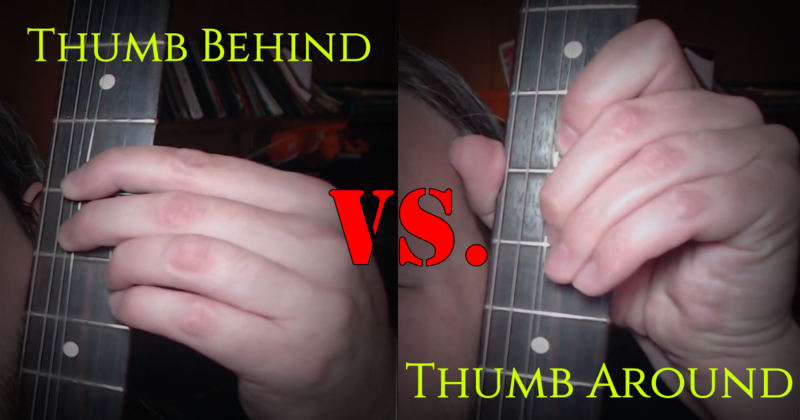 Recent guitar question: How do you bend strings without wrapping your thumb around the neck? 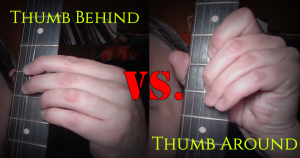 I find that a lot of people initially learn to play the guitar with less than ideal left hand technique, especially on the electric guitar. I’ve gone over the benefits of using a neutral thumb technique (thumb in the middle of the back of the neck) for reach, ideal joint movement, and facility, but I haven’t talked about extended techniques like bending. That being said, if you don’t have too many problems switching between thumb positions, don’t stress about relearning everything at once. What matters is that you can execute the techniques you want to and make the music sound good, not that you play with perfect technique. Technique serves the music, not the other way around. In case anyone is wondering, I also play on fairly light strings (.09 for the high e) which makes everything easier. If you are having trouble muscling through your strings, consider going to a lighter set – most of the shredders I know and have met over the years play on LIGHT strings, not heavy. Playing on .12s doesn’t make you more of a man. A great person to watch to see what I mean is Jari Maenpaa of Wintersun – you can find many of his videos on youtube and he uses a neutral thumb technique for bends. bend, bending, blues, classical guitar, electric guitar, guitar, guitar technique, metal, technique. Bookmark.